The Fairshare Model | A performance-based structure for venture-stage Initial Public Offerings (IPO). 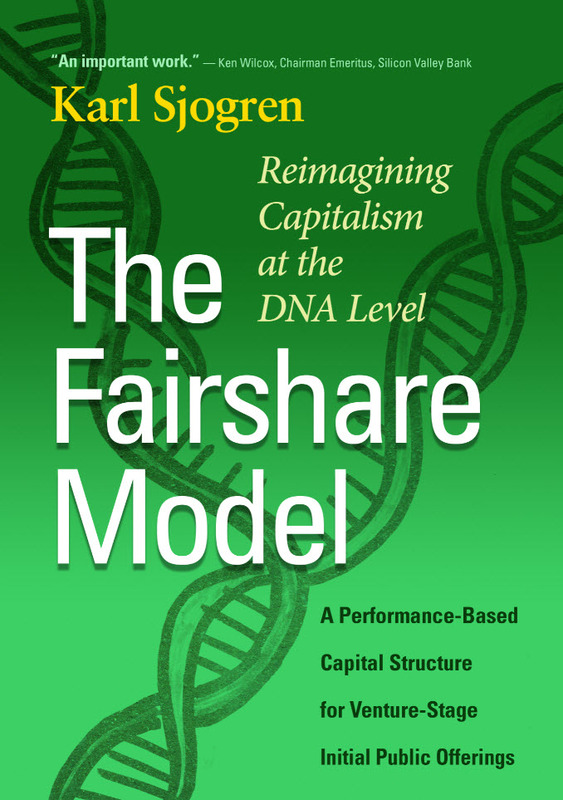 The Fairshare Model is book that describes a performance-based capital structure for a venture-stage initial public offering (IPO). The principle can be applied to an initial coin offering (ICO) or initial token offering (ITO) that is used to raise equity capital–as opposed rewards-based, or donation-based crowdfunding. I call it The Fairshare Model because it aligns the interests of investors and employees. It has implications for how to attract funding to companies that have poor access to equity funding but who have the ability to attract an affinity group of public investors. More significantly, it has potential to help companies attract and manage human capital. The Fairshare Model was conceived to deal with the uncertainty involved in establishing a value for a venture-stage company. There are ways to mitigate the risk of getting it wrong in a private offering, deal terms. But there is no equivalent in an IPO. The Fairshare Model changes that with a deal structure that places no value on future performance. It does that by providing shares for future performance that vote but cannot trade; they convert into the tradable stock based on performance milestones.